The bio of Charles Orchard Sharp | Launceston Then! Charles was born in 1856 to Charles and Sarah Sharp at Bloomsbury, Middlesex. His father was a Printer Compositor. In the 1861 census the family were living at No. 33, Upper Rosomon Street, Clerkenwell, London. With a scholarship he attended St. Thomas’s School, Everilda street, Islington and in 1870 was awarded the silver medal for those that had held a scholarship for twelve months. He married Louisa Eliza Hickson in 1879 and they set up home at No. 39, Windsor Road, Islington, London, with their first child Alice. Charles was working as a journalist with the ‘Daily Chronicle in 1881. In 1891 the family are still living in Islington this time at Moray road and the family had expanded with the addition of Mary-b. 1882, Francis-b. 1884, George Hickson-b. 1885-1937 and Charles Edward-b. 1890. In 1895 their final child was born Jack Richard who would perish during World War One. He rose to being the sub-editor of the ‘Daily Chronicle’ but in June 1899 he left this position and was presented with a clock for his services. In 1904 Charles became editor and governing director of the ‘Cornish and Devon Post’ in Launceston, acquiring the business from the previous editor Mr. William Lydra Powell. He soon became a well respected member of the community and was well known for his fair and just comments. 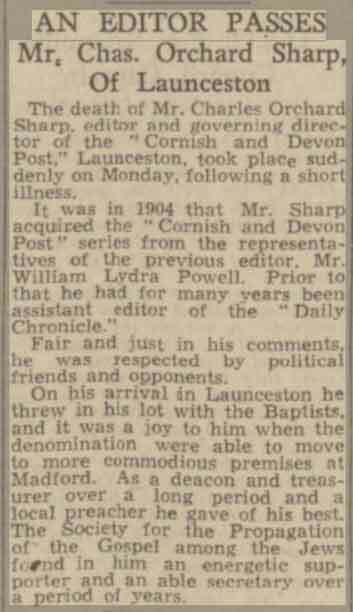 On his arrival to Launceston, he threw his lot in with the Baptists then at Western road, but he was delighted when the denomination moved to the larger premises at Madford House in the 1920’s. He was a deacon and treasurer over a long period as well as a local preacher. He was also a supporter and secretary to ‘The society for the propagation of the gospel among the Jews’. Tragedy struck in 1907 when Louisa his wife died. He is found to be living at No. 31 Cranbourne Avenue, Plymouth in 1911 with his daughter Francis and son Jack. As mentioned Jack was killed during World War One, but his eldest son George also served as a Gunner with the R.F.A. (Regimental No. 37692) but due to illness he was discharged on the 27th of August 1916. On the 4th of December 1917 at the Exmouth Baptist church he married Amy Tupman daughter of Exmouth Pilot Mr. E. G. Tupman of Hartlley cottage, Exmouth. On returning to Launceston, Amy became an active member of the Baptist church becoming the organist. More tragedy was to befall Charles when Amy died on the 30th of January 1934 at Portland place, Bath. She had taken to Bath with an illness on medical advice. In 1937 his eldest son George passed away. Charles passed away on the 26th of October 1942 at his home in Launceston. 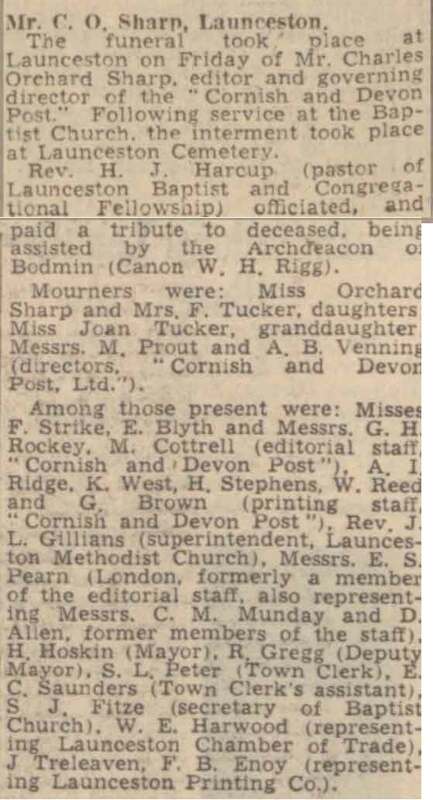 His funeral service was held at Launceston’s Baptist church at Madford House being conducted the Rev. H. J. Harcup assisted by the Archdeacon of Bodmin, Canon W. H. Rigg. After the service he was interred at Launceston Cemetery.